Marketing intelligence is the systematic collection and analysis of publicly available information about consumers, competitors, and developments in the marketplace. The goal of marketing intelligence is to improve strategic decision making by understanding the consumer environment, assessing and tracking competitors' actions, and providing early warnings of opportunities and threats. Marketing intelligence gathering has grown dramatically as more and more companies are now busily eavesdropping on the marketplace and snooping on their competitors. Techniques range from monitoring Internet buzz or observing consumers firsthand to quizzing the company's own employees, benchmarking competitors' products, researching the Internet, lurking around industry trade shows, and even rooting through rivals' trash bins. 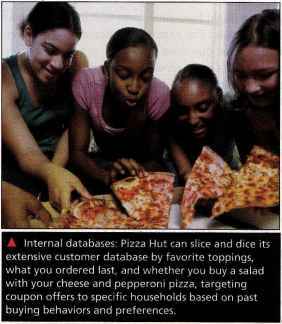 Internal databases: Pizza Hut can slice and dice its extensive customer database by favorite toppings, what you ordered last, and whether you buy a salad with your cheese and pepperoni pizza, targeting coupon offers to specific households based on past buying behaviors and preferences. The online world is changing,,, Nielsen Online delivers the data, intelligence and Insights to help marketers, publishers, technology companies, arid agencies thrive on this change. Nielsen Online measures vat empowered, and engaged online consumera. Are you listening? Many companies routinely monitor consumers' online chatter with the help of monitoring services such as Nielsen Online. 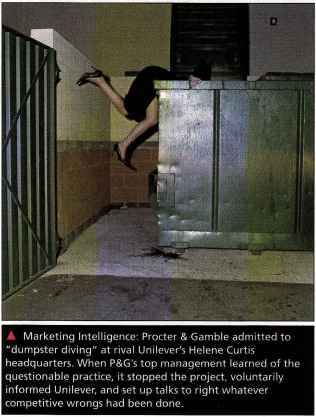 Marketing Intelligence: Procter & Gamble admitted to "dumpster diving" at rival Unilever's Helene Curtis headquarters. When P&G's top management learned of the questionable practice, it stopped the project, voluntarily informed Unilever, and set up talks to right whatever competitive wrongs had been done. Much competitor intelligence can be collected from people inside the company— executives, engineers and scientists, purchasing agents, and the sales force. The company can also obtain important intelligence information from suppliers, resellers, and key customers. Or it can get good information by observing competitors and monitoring their published information. It can buy and analyze competitors' products, monitor their sales, check for new patents, and examine various types of physical evidence. For example, one company regularly checks out competitors' parking lots—full lots might indicate plenty of work and prosperity; half-full lots might suggest hard times. Some companies have even rifled their competitors' garbage, which is legally considered abandoned property once it leaves the premises. A In one classic garbage-snatching incident, Procter & Gamble admitted to "dumpster diving" at rival Unilever's headquarters. Unilever's dumpsters yielded a wealth of information about strategies for Unilever's hair care brands. However, when news of the questionable tactics reached top P&G managers, they were shocked and immediately stopped the project. Although P&G claims it broke no laws, it noted that dumpster raids violated its business policies. Competitors often reveal intelligence information through their annual reports, business publications, trade show exhibits, press releases, advertisements, and Web pages. The Web has become an invaluable source of competitive intelligence. Using Internet search engines, marketers can search specific competitor names, events, or trends and see what turns up. Moreover, most companies now place volumes of information on their Web sites, providing details to attract customers, partners, suppliers, investors, or franchisees. This can provide a wealth of useful information about competitors' strategies, markets, new products, facilities, and other happenings. The intelligence game goes both ways. Facing determined marketing intelligence efforts by competitors, most companies are now taking steps to protect their own information. For example, Unilever conducts widespread competitive intelligence training. Employees are taught not just how to collect intelligence information but also how to protect company information from competitors. According to a former Unilever staffer, "We were even warned that spies from competitors could be posing as drivers at the minicab company we used." Unilever even performs random checks on internal security. Says the former staffer, "At one [internal marketing] conference, we were set up when an actor was employed to infiltrate the group. The idea was to see who spoke to him, how much they told him, and how long it took to realize that no one knew him. He ended up being there for a long time. "12 The growing use of marketing intelligence raises a number of ethical issues. Although most of the preceding techniques are legal, and some are considered to be shrewdly competitive, some may involve questionable ethics. Clearly, companies should take advantage of publicly available information. However, they should not stoop to snoop. With all the legitimate intelligence sources now available, a company does not need to break the law or accepted codes of ethics to get good intelligence. Author I Whereas marketing Comment | intelligence involves actively scanning the general marketing environment, marketing research involves more focused studies to gain customer insights relating to specific marketing decisions. The systematic design, collection, analysis, and reporting of data relevant to a specific marketing situation facing an organization. In addition to marketing intelligence information about general consumer, competitor, and marketplace happenings, marketers often need formal studies that provide customer and market insights for specific marketing situations and decisions. For example, the beer-maker Budweiser wants to know what appeals will be most effective in its sports advertising. Google wants to know how Web searchers will react to a proposed redesign of its site. Or Samsung wants to know how many and what kinds of people will buy its next-generation LCD televisions. In such situations, marketing intelligence will not provide the detailed information needed. 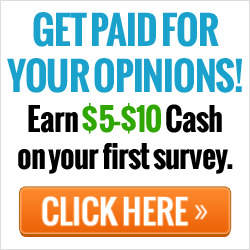 Managers will need marketing research. Marketing research is the systematic design, collection, analysis, and reporting of data relevant to a specific marketing situation facing an organization. 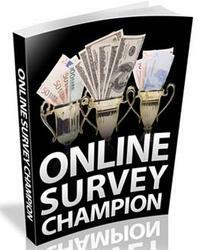 Companies use marketing research in a wide variety of situations. For example, marketing research gives marketers insights into customer motivations, purchase behavior, and satisfaction. It can help them to assess market potential and market share or to measure the effectiveness of pricing, product, distribution, and promotion activities. Some large companies have their own research departments that work with marketing managers on marketing research projects. This is how Procter & Gamble, Unilever, and many other corporate giants handle marketing research. In addition, these companies—like their smaller counterparts—frequently hire outside research specialists to consult with management on specific marketing problems and conduct marketing research studies. Sometimes firms simply purchase data collected by outside firms to aid in their decision making. The marketing research process has four steps (see #> Figure 4.2): defining the problem and research objectives, developing the research plan, implementing the research plan, and interpreting and reporting the findings. What is the marketing intelligence of unilever? How can companies collect markering intelligence? How is marketing intelligence assist organisation to set sales objective? How marketing intelligence assists the marketers in the promotion sales volume? What is garbage handling as used in marketing intelligence? What are marketing intelligence strategies of unilever?